And we’re back again with another cutesy product from Too Cool For School! 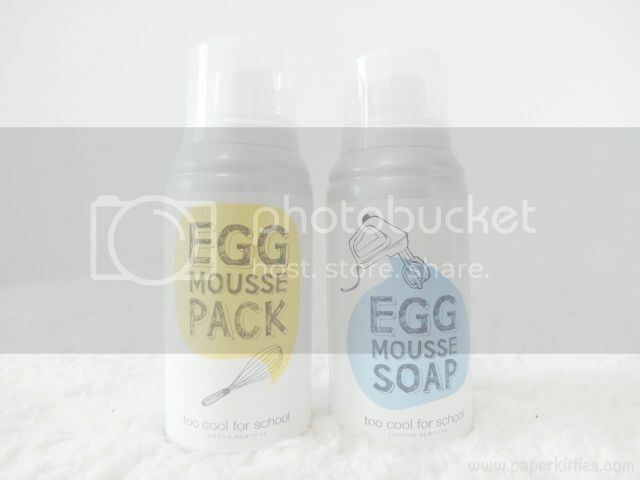 Here’s introducing the hot-selling Egg mousse pack and soap special duo! This wash-off mousse duo pumps out extra soft, mild and delicate foam. Remember to shake vigorously before use! Nothing complicated, it is really simple to use. Pump a suitable amount with dry hands and blot it on the face (in this case my hand). Massage and leave it on the face for 2 mins, before washing up in lukewarm water. Basically the Egg Mousse Pack claims to draw out sebum and impurities from pores while egg proteins nourish skin and restore elasticity. Although it is stated more of a twice weekly mask than a daily cleanser, the fine texture of the Egg Mousse Pack is really light without ripping the moisture out of my skin – making it alright for daily usage imo. As it is packed with CO2 Propellants (that is odourless, mild and high moisture essence) along with an abundance of egg yolk and egg white extract, skin is left feeling moist and bright. In fact, it is recommended to be used as a warming up pack before makeup so that they will have longer lasting power. Moving on to the Egg Mousse Soap that can be used for cleansing or even as a shaving foam for men! Compared to the Egg Mousse Masi, this is more of a deep cleansing product that thoroughly cleanse your pores and removes surface impurities. The texture of this soft creamy foam is more bubbly and easier to lather. It perfectly coats skin surface to gently cleanse face without stripping; leaving skin clean, fresh, and smooth. Ingredients wise, the egg white extract controls excessive oil to clarify skin surface, and helps to shed dead skin cell while egg yolk extracts provide nourishing effect. I would say that the Egg Mousse Soap is not as good in removing heavy makeup so don’t rely on it to remover your eyeliner and mascara.. you’ll need something much stronger and thorough. 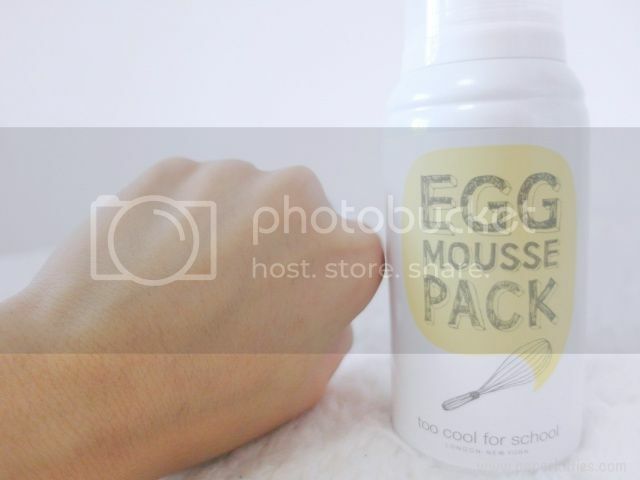 I would advise that you always use a makeup remover prior to using Too Cool For School Egg Mousse Pack & Soap Special Duo.